My new sneakers make me smile. I think they're sneak-tastic. 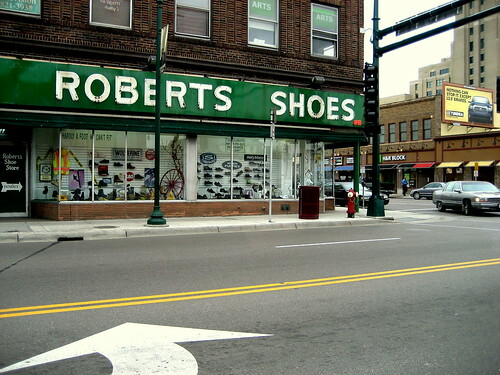 I picked them up at Robert's Shoe Store on E Lake Street. The shoes were released in June 2007, as part of Nike's new Air Force 1 City Series. I bought them cuz they are awesome and perfect for sneaking. The basketball footwear in the New York collection evince the flash and showmanship of the Big Apple’s best ballers and its courts. For these athletes, Nike created AF1s as sophisticated as they are strong, and as smooth as they are sturdy. To symbolize this combination, the NYC shoes draw upon the inspiration of Patterson Square, Rosie’s Dry Goods and the Gauchos. Graphic highlights celebrate these New York institutions with roses and a thorn ball signifying Rosie’s, CHOZ ’78 commemorates the Gauchos’ inaugural year in the AAU program and a design pulled straight from the Patterson Square backboard is a tribute to that legendary court. The XXVth Anniversary AF1 Box is Neutral-Grey with white accents(swoosh and AF1 logo). The lace medallion has been updated as well. And we can't forget the Air Force One XXVth anniversary card of authenticity a collectors dream! The shoes came with a medallion, which was a little OTT...even for ME! I put the medallion in my jewelry box. I never thought of having pink and yellow laces together - I heart that! *The bldg is owned by a Greek-American, or, as the GS would say: a "GA."
Thanks ladies! I'm loving these sneakers. Ranty - I always wanted to shop there. I was happy with the selection.